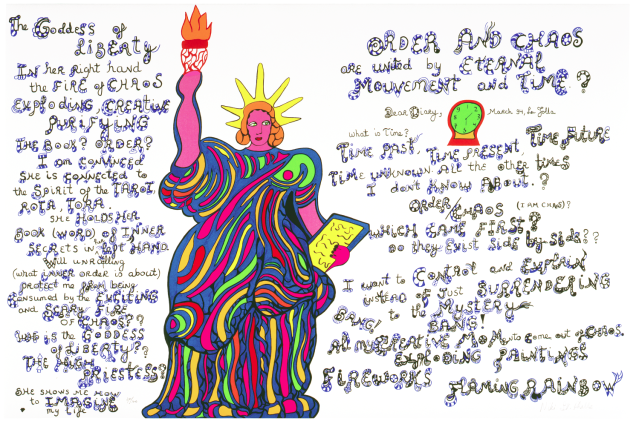 August 4th marks the opening of a new exhibition at Nohra Haime Gallery, New York which showcases a series of large, colorful prints by artist Niki de Saint Phalle. “CALIFORNIAN DIARY is a collection of silkscreens that compose a visual diary of Saint Phalle’s life and work during her first year in California. [They] consist of personal designs and drawings of figures and landscapes accompanied by entries and notes about her experiences,” the gallery informs. The artist’s connection to California started in the 1960s with a first visit with Swiss kinetic artist Jean Tinguely, and lasted well throughout her career. In 1962 Saint Phalle shot up enormous Tir Tableaus on Sunset Boulevard and in Malibu’s scenic hills. 1983 saw an installation on San Diego’s UC campus: Sun God, which quickly became a favorite among the students. Ten years later Saint Phalle moved to La Jolla for her health and settled there until her death in 2002. California was a constant source of inspiration for the artist. It re-awakened her fervor to create which is reflected in her later œuvre with expansive projects like Gila (1996), Coming Together (2001) and Queen Califia’s Magical Circle (1999-2003). The “open conversations” with her diary, supposedly intimate and secret, candidly capture her contemplations about her new surroundings, landscapes, people, and life itself. TIME UNKNOWN. All the other times I don’t know about? ORDER / CHAOS (I am chaos) ? Do they exist side by side?? All MY CREATIVE MOMENTS come out of CHAOS. The exhibition is on view until September 12th. An opening reception is scheduled for Tuesday, August 4th from 6 – 8 pm.